Governance of Marine Fisheries and Biodiversity Conservation explores governance of the world’s oceans with a focus on the impacts of two inter-connected but historically separate streams of governance: one for fisheries, the other for biodiversity conservation. Chapters, most co-authored by leading experts from both streams, investigate the interaction of these governance streams from ecological, economic, social and legal perspectives, with emphasis on policies, institutions processes, and outcomes on scales from the global to the local community, and with coverage of a range of themes and regions of the world. The book opens with chapters setting the historical context for the two marine governance streams, and framing the book’s exploration of whether, as the streams increasingly interact, there will be merger or collision, convergence or co-evolution. The concluding chapter synthesizes the insights from throughout the book, relative to the questions posed in the opening chapters. It also draws conclusions about future needs and directions in the governance of marine fisheries and biodiversity, vital to the future of the world’s oceans. 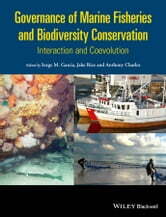 With cutting edge chapters written by many leading international experts in fisheries management and biodiversity conservation, and edited by three leading figures in this crucially important subject, Governance of Marine Fisheries and Biodiversity Conservation is an essential purchase for fisheries scientists, economists, resource managers and policymakers, and all those working in fields of biodiversity conservation, marine ecology, and coastal livelihoods. Libraries in all universities and research establishments where environmental and/or marine studies, conservation, ocean policy and law, biological and life sciences, and fisheries management are studied and taught, should have copies of this most important book.